Another exciting FREYGEIST week is almost over: Roughly 1,000 Companists, total investments of over 1.3 million euros, and our new powerful partner from industry for the development and production of our FREYGEIST e-bike – German Answer – will ensure a flying start of our company even before our market launch. Last week, we signed an agreement with German Answer. This German company operates at a global level and is well known within the market for its premium bicycle parts, for instance for its "Kilo" mountain bike suspension forks. As you know, FREYGEIST selects all product components very carefully and guarantees first-rate personal quality management from the first screw to final delivery. Together with the world's best partners, we meet our self-imposed quality objectives. Thus, we are pleased to welcome german: A. to the FREYGEIST team! "FREYGEIST has developed a very convincing concept for the future of urban mobility. Our standards in terms of quality and lightweight bikes overlap in many ways." For more information on our new partner, please see http://www.german-a.de. 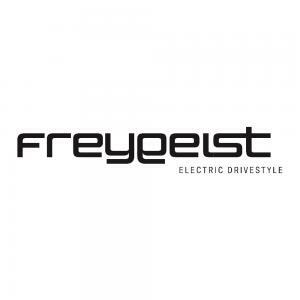 Our market launch is near: In late summer, we plan to deliver the first FREYGEIST e-bikes produced in the german: A. production facilities near Frankfurt to customers. Public interest in the FREYGEIST e-bike is still very high, and pre-orders speak for themselves: As the first series sold out shortly after its presentation, our current waiting list is already several months long before the market launch. Thus, make sure you get your reward before it's too late!